There is a range of fitness tests using cycling as the primary exercise mode. Many of these cycling fitness tests utilize a cycle ergometer. Cycle ergometers is usually a stationary device that measures power while a cyclist pedals against a resistance. There are several types of cycling ergometers available, often defined by the mode of resistance, which are listed below. Monark - The Monark cycle ergometer is the most widely used ergometer in sport science research. The Monark bikes use a friction-braked ergometer. The frictional force is generated by a belt sliding against a rotating fly-wheel, which is balanced and measured by a hanging weight. The resistance, and therefore the power output required, changes with changes in pedalling speed and belt weight. Lode - The pedalling resistance is provided by electromagnetic braking, which enables the work rate to be set to a constant value independent of pedalling speed. Repco - On Repco ergometers, vanes around a flywheel create air resistance. Kingcycle - another ergometer where the pedal resistance is provided by air resistance, though this time through a roller and fan attached to the rear wheel of the cyclist's own bike. SRM cranks - Sometimes the subjects are able to use their own bicycle with SRM cranks, which allow measurement of power through the drive train in real or simulated competitions or in the laboratory. In the lab the bike can be placed on rollers or a treadmill. This has the advantage of being able to use the correct bike setup for the athlete. Calibration of ergometers is recommended, so you can make accurate comparisons between athletes tested on different machines. Pedalling rate can easily be assessed by counting the number of revolutions every minute and compare it to the revolutions displayed on the machine. The power measures of the ergometers are not so easily checked. Calibrating cycle ergometers may require a dynamic calibration with a special rig. 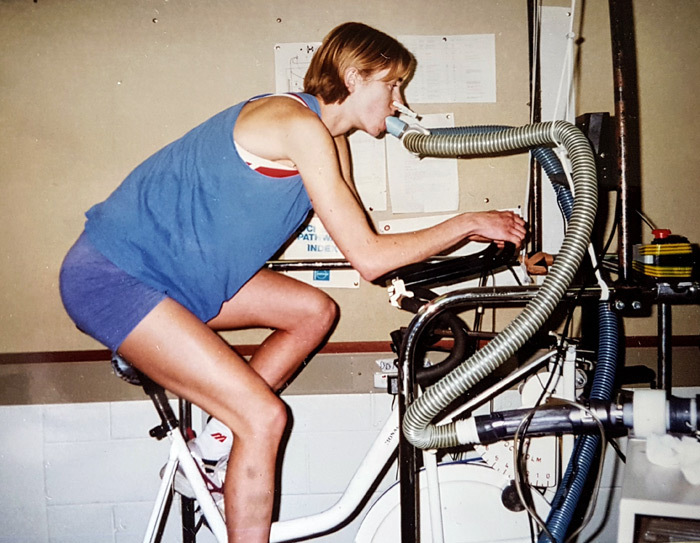 Cycling Maximal Oxygen Consumption Test (VO2max) — a maximal exercise test to measure VO2max while riding a cycle ergometer. Astrand-Rhyming Bicycle Ergometer Test — a submaximal aerobic fitness test on a cycle ergometer. Wingate Cycle Test — a cycle test of anaerobic leg power, conducted over 30 seconds. Paton CD, Hopkins WG., (2001) Tests of cycling performance. Sports Med. 2001;31(7):489-96.